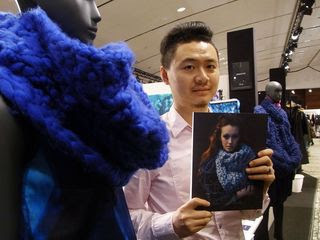 Paris, March 3 (CNA) Taiwanese fashion designer Johan Ku's knitwear was featured on the cover of the 2012 Tranoi Femme Trade Shows magazine during Paris Fashion Week, outshining more than 450 international fashion designers who were displaying their fashions at the fair. His bluish knitwear, made of merino wool with different size stitches combined with asymmetric wool and leather fabric, was again the center of attention in the fashion world following his inroads in New York, Paris and Tokyo in previous seasons. With the theme of the movie "Bleu" in mind, the London-based Taipei native featured a bluish hue in his 2012/2013 women's autumn/winter collection. "French people really love my design," Ku said excitedly at the Carrousel du Louvre shopping center, where his signature chunky, yet ultra-feminine knitwear, is on display. Ku said being unique is an important factor for one to shine on the international stage, adding that his goal was to have his name pop up in people's minds whenever they saw large-styled knitwear. Another young rising designer to watch was Shao Yen Chen, also from Taiwan, whose 2012/2013 autumn/winter collection, named "Class", is on display at a gallery in downtown Paris, along with works by 20 other British fashion designers. His collection included coats made of woolen fabrics and highlighted with colorful wool displayed around the neckline. They were also mixed with an athletic-inspired feel. Chen said he likes to find a balance between artistic design and practicality in his work. The Paris Fashion week is scheduled Feb. 28 to March 7.